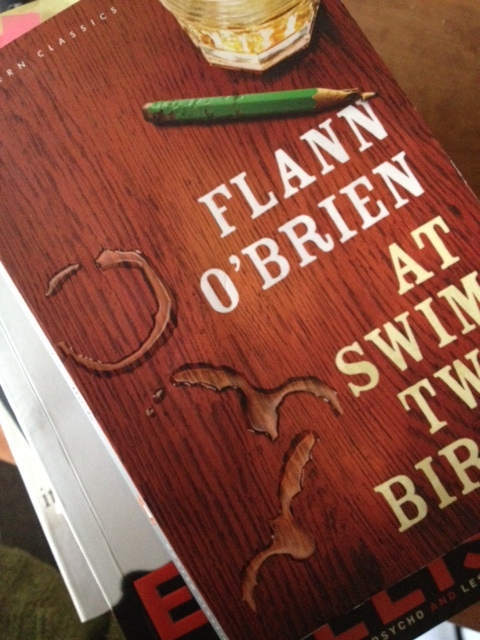 Book: At Swim-two-birds, Flann O’brien. First pub. 1939. This ed.Penguin Modern Classics 2001. Why: This is one of my all time favourite books, as with all books it’s not to everyone’s taste. I’m reading it for the second time as I always promised myself I would. It’s the pacing and rhythm, the unique details in aid of the ‘show don’t tell’ rule, the many stories in one (meta-fictional aspect) and as the book goes on the bizare happenings like the characters of a story who revolt against the author, that get me. Three fifties of fosterlings could engage with handball against the wideness of his backside, which was large enough to halt the march of men through a mountain pass. I know the studying you do in your bedroom, said my uncle. Damn the studying you do in your bedroom. Nature of denial: Inarticulate, of gesture. I closed my eyes, hurting slightly my right stye, and retired into the kingdom of my mind. For a time there was complete darkness and an absence of movement on the part of the cerebral mechanism. There was nothing unusual in the appearance of Mr. John Furriskey but actually he had one distinction that is rarely encountered – he was born at the age of twenty-five and entered the world with a memory but without a personal experience to account for it. His teeth were well-formed but stained by tobacco, with two molars filled and a cavity threatened in the left canine. I love this book too. its a wild, sometimes bizzare ride, but well worth the journey. I have started reading it twice now, but find it very hard going. It sits in my bedside reading pile and may yet be completed. One day. Definitely not one to start reading at the end of a long day Andrew…possibly needs a clear head. I’ve got one of those piles too – the ‘one day’ pile. Hi Julie, I’m also a Flann fan – but my favourite is The Third Policeman – quite ingenious.